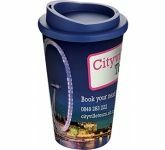 Regardless of whether you are a large corporate business, charity, school, university, gym or sole trader, travel mugs are a low cost promotional product which will only enhance your marketing, fundraising and brand building efforts and most importantly, they travel! 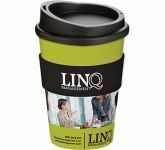 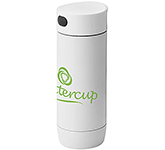 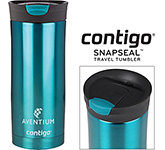 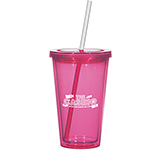 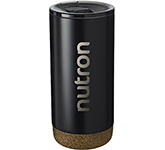 Fabulous for handing out at trade shows, conferences, exhibitions and outdoor events, branded travel mugs printed with your logo and important message are sure to be well received and used long after the event is over. 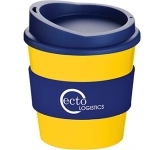 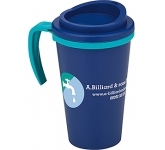 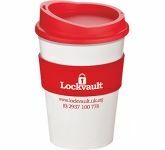 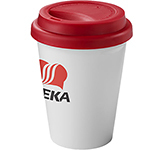 Our extensive range of plastic mugs come in all shapes and sizes, with double walled or single walled thermal construction, silicone lids, ergo-friendly rubber grips, leak-proof lids and practical spill resistant thumb sliders. 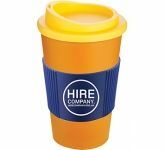 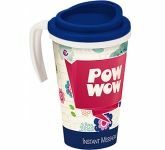 Bright and colourful and budget friendly, plastic travel mugs are ideal for tight budget promotions and are guaranteed to be used over and over again. 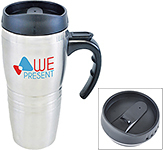 Why not also read about why promotional travel mugs are the ethical choice when it comes to marketing and promotions. 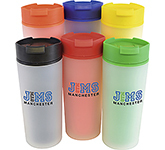 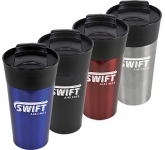 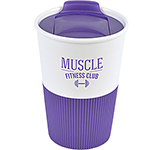 If you are a sports club or gym owner then corporate travel mugs are sure to tick all the right boxes! 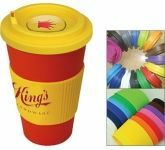 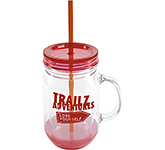 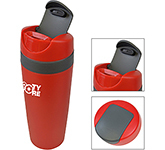 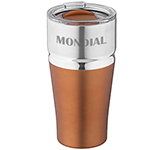 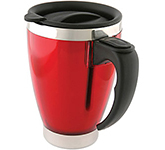 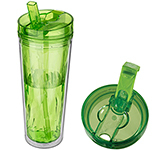 Practical in nature and perfect for either hot or cold drinks, featuring anti-spill drinking spouts and available in a huge choice of vibrant colour options. 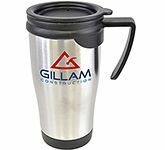 Select from stainless steel promotional travel mugs or aluminium options for a truly corporate feel or fashionable frosted finishes for a trendy modern look, the choice is yours and there are plenty of them! 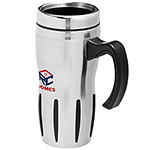 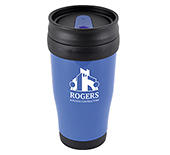 For on-the-go promotions you can't beat our range of take-out mugs! 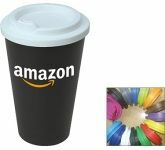 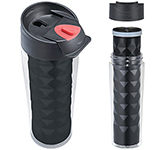 Featuring resealable lids and comfortable user friendly rubber grips, they are ideal for avoiding unwanted coffee spills whilst travelling to and from the office. 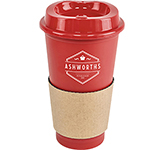 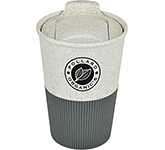 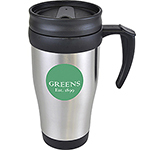 Practical in nature and available in a massive choice of colour options, these recyclable BPA free giveaways are in addition perfect for demonstrating your environmentally friendly business credentials. 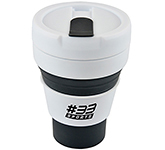 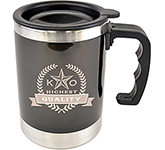 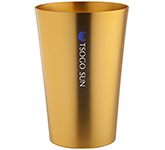 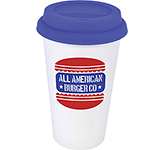 Why not take a look at our most popular range of branded Americano mugs. 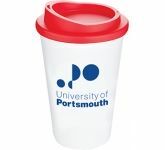 At GoPromotional we have a dedicated team of passionate and creative designers who are always available to provide professional advice when it comes to ensuring that your logo is reproduced to create the maximum visual impact, thus ensuring your brand is always represented in the best possible way. 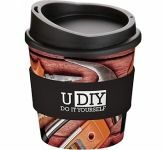 Why not take advantage of our free, no obligation virtual sample service and see what they can come up with. 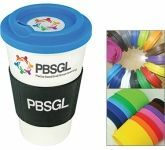 We offer a comprehensive choice of branding options on our entire range of travel mugs and are at the fore front of printing technology to ensure your finished promotional products always look truly eye-catching and professional. 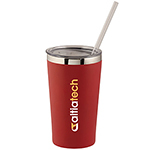 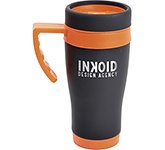 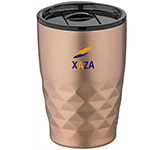 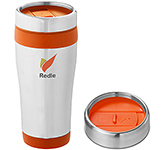 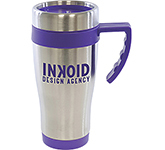 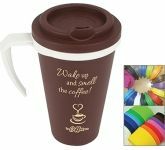 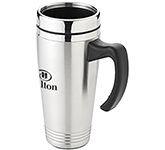 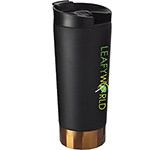 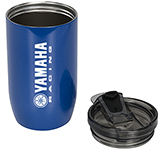 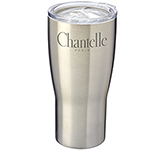 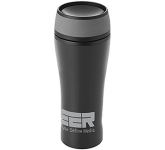 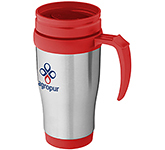 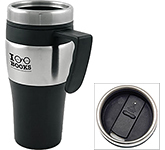 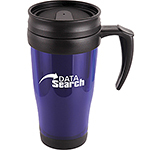 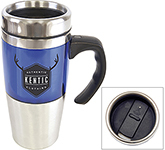 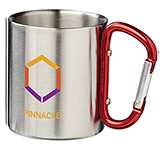 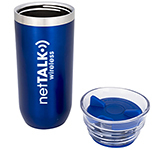 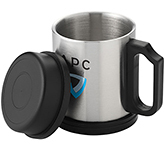 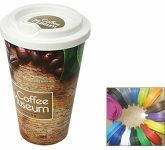 Screen printing and UltraHD full colour print are the preferred choice for plastic travel mugs, however on our metal and stainless steel mugs we can also offer precision laser engraving or etching to create a truly stunning finish which makes them ideal for corporate giveaways or special business gifts. 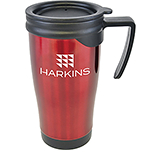 Our average delivery is around 7-10 working days, subject to the quantity and print required on your travel mugs. 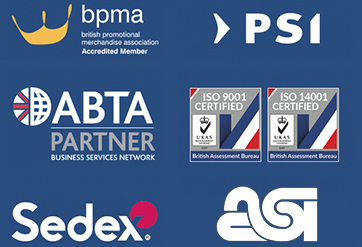 If however, you have an urgent requirement for a last minute event, exhibition, trade show or corporate promotion, just give us a call and we will always make every effort to help. 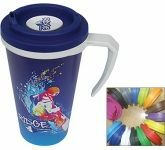 At GoPromotional we guarantee to beat any like for like quotation and pride ourselves on offering not just fantastic promotional merchandise and award winning service, but also the lowest prices and best value for money. 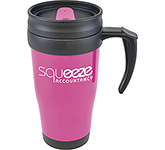 So, if you do manage to find a cheaper price for the same product, please give us a call and we will guarantee to match it for you!